Use a rock maple cutting board or Butcherblock Table since it is heavy and will not slide around while working. In a mixer, with paddle attachment combine the butter and brown sugar, whip until fluffy. Scrape the bowl several times using a rubber spatula. Add the flour and spices to the mixer, blend together. We use a fine microplane grater to quickly grate fresh nutmeg. Add the water, mix. Add more flour if needed, it depends on the brand and the time of year). You may want to switch to the dough hook to finish the dough, we knead it on our John Boos Butcherblock for a few minutes. Make a template of your ideal gingerbread house, we use a cereal box and cut it up to size (this year we made ours 8 in. x 8 in. x 12 in. tall). Roll out half the dough to desired thickness, we recommend using two wooden rulers as guides with rolling pin to get the proper thickness and sizes. Make a front, back, two sides, cut the door in front, cut out windows in sides. Make 2 roof pieces (roof should have overhang from sides. Use leftover dough to roll out again and make a chimney and use a cookie cutter to make gingerbread or other cookies. Preheat oven to 375 f., All pieces should be fairly thick and strong, you can use a dough scraper for easy straight lines, we also use a paring knife, both work well for making bricks and roof indentations. Place on cookie sheets (do not line them). We bake our gingerbread pieces for 25 to 45 minutes, small cookies take less time, until slightly brown. The pieces must cool for several hours before assembling. We usually wait until the next day. Yes, this is a big process, but after you build 1 it gets easier. Royal Icing ; Use this to assemble and decorate. Place 8 oz. of powdered sugar in your mixer with the whip attachment, add a pinch of cream of tarter and 2 oz. egg whites (about 2 egg whites) and whip on high until smooth, add more sugar if needed to make a thick icing that can be piped through a pastry bag, keep icing covered with a damp towel until needed. Flat Icing; Use this to decorate your roof and base ( the base can be cardboard or Styrofoam. 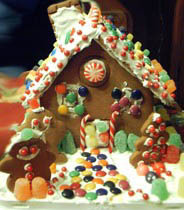 We have made gigantic Gingerbread Houses with plywood bases and real glass windows and doors. Candy decorations the skys the limit, add your favorites, royal icing will hold them on. Hard candy can be melted in the oven (very nice for windows). Chefs Notes: Buy lots of toothpicks, these are your friends during assembly. Patience, hope you find some as this takes some time. All of our ingredients are weighed on a Stainless Steel Scale. We like Ceresota unbleached flour the best. My favorite Spatula is the large RED High heat scraper, I use it for everything from dough to icing to omelets! We also have a reusable gingerbread house mold, located here to make this whole process simple!